You're looking at the catch of the day, er month, er ... ever. 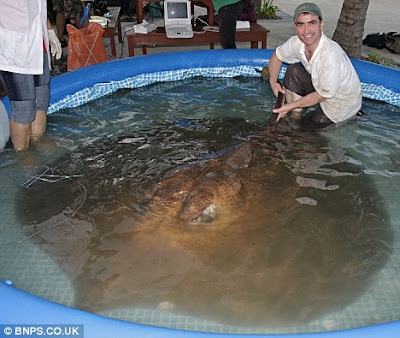 That's the largest stingray ever caught. 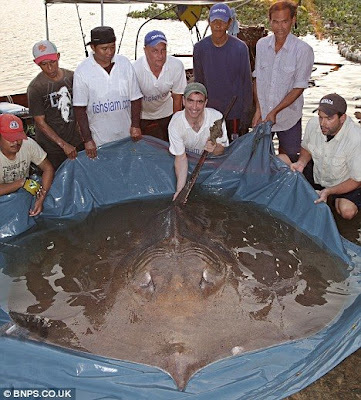 At seven feet seven inches, and 771 lbs, that's a lot o' stingray. And that length doesn't include the additional length for the poisonous tail (yeah, the one in the fisherman's hands). British angler Ian Welch is credited with the catch, which took place in the Maeklong river of Thailand. Welch caught it as part of a tag and release program that's in place to help track the various fish populations of the Maeklong. It took 13 men to drag it to shore, where it was loaded into an inflatable pool, tagged, and then released back into the wild. Which is for the best: this stingray was so heavy in part because she was so pregnant. That explains her radiance, that subtle beauty and grace that only a gravid female can achieve. Most fish catch their prey via suction (snapping their jaws open and creating negative pressure, thereby dragging their prey into their mouth with the rush of water). Not so with the moray eel. No, this eel is too fancy, too uppity for that. In fact, the moray eel is the only known fish to employ a second set of jaws located further down the throat that reaches out to grip its food and drag it down the esophagus. Yes, just like in Aliens. Don't believe me? Just watch this video from my own alma mater , UC Davis. Some of you parents might begin suspecting your teenage sons of having a set of these. Thanks for the video, Amanda. Chimpanzees have been in the news lately, and not with happy endings. I'll focus on Cinder the Hairless Chimp. I've posted on Cinder before. She was a sweetheart 14-year-old chimp who lived at the St. Louis Zoo. She suffered from an autoimmune disorder known as Alopecia universalis that caused all of her hair to fall out starting when she was still young (that's her on the left--doesn't get much cuter). The next photo is one of her in her hairless prime, being a cheeky monkey for the camera. She was a favorite at the zoo until she died unexpectedly last Sunday (Feb 15). Her cause of death is still unknown, despite a thorough necropsy. The lab results might yield some answers. 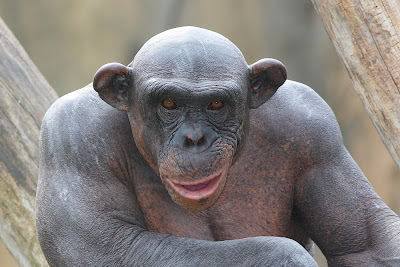 Until then, here's the Cinder the Hairless Chimp. The world needs more chimps like you, and more people like the folks that cared for you. Thanks for the news, Mary. Danielle made the mistake of stumbling across this photo while eating strawberry cheesecake ice cream. Her floor nearly received its first ever regurgitated lactose treatment. There are around 1,400 species of identified scorpions worldwide. Not all are found in the desert. 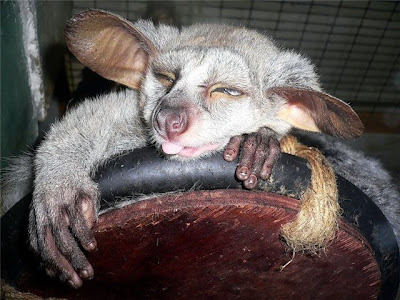 They can be found in the tropics, in intertidal zones, mountainous forests, and some have even been found under rocks at the snowy elevation of 12,000 feet in the Himalaya mountains (yes, just one more threat to consider while trying to reach the summit). 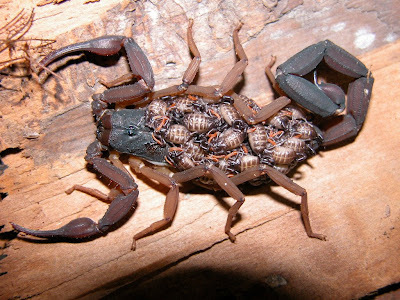 Not all scorpions sport young ones on their back, but this is a trademark of many a scorpion species: the mothers toting their young around on their backs until the young have their first molt. That must be a bittersweet moment for the mother. Watching, with a heavy but happy heart, her baby molt, knowing that it will venture out into the world, eat insects, frighten humans, and propagate the species. But she's no doubt relieved to have fewer scorpion whelps (great band name!) to cart around. Thanks, Danielle. Next time you're eating you might want to surf the cuter web shores. A bunch of you alert readers sent this in to me, and for good reason. 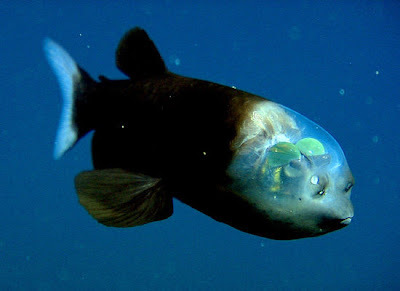 It's not every day that we get to encounter a fish with a transparent head and barrel eyes. Researchers at the Monterey Bay Aquarium Research Institute recently solved the half-century-old mystery of a fish with tubular eyes and a transparent head. 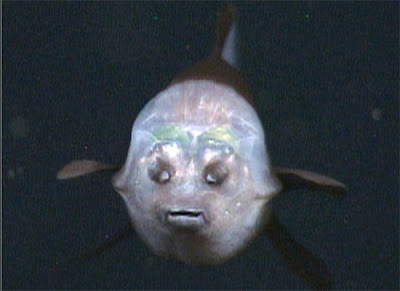 Ever since the "barreleye" fish Macropinna microstoma was first described in 1939, marine biologists have known that it's tubular eyes are very good at collecting light. However, the eyes were believed to be fixed in place and seemed to provide only a "tunnel-vision" view of whatever was directly above the fish's head. A new paper by Bruce Robison and Kim Reisenbichler shows that these unusual eyes can rotate within a transparent shield that covers the fish's head. 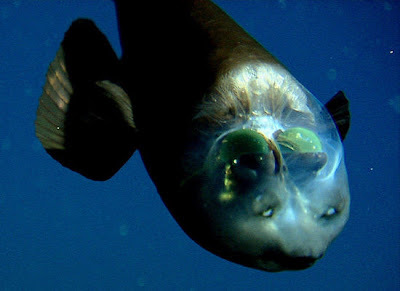 This allows the barreleye to peer up at potential prey or focus forward to see what it is eating. I can imagine all sorts of benefits of having a see-through dome. Medical examinations of the brain would be much easier, prospective mates could evaluate the probable intelligence of those who are courting them by inspecting the wrinkles of the neocortex, and I'm sure the fashion industry would come up with all sorts of fancy dies and inks that could be injected into the head to show how trendy you are. You might even be able to tattoo your brain. Oh, the possibilities. How about it, science? Can we do this or what? Chances are though, if you've got a visible brain, you're probably a villain, a la Krang of Teenage Mutant Ninja Turtles. Science, you can stand down on this one. Thanks for the Macropinna, Chris, Jade, Mike, Peer, Summer, Carrie, and Ida. Look at the end of this post for some video. 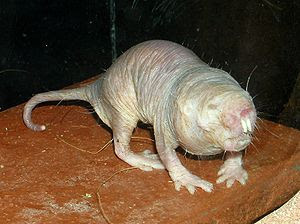 Arne reminded me that it's been a while since my last naked mole-rat (oder Nacktmull, auf Deutsch). It's time to revisit one of my favorite animals. 1) They are African rodents that live in matriarchal hives. 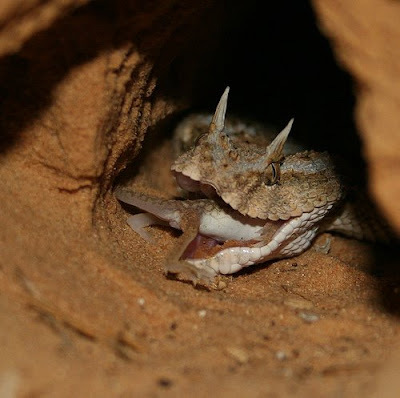 2) They aren't warm blooded in the true sense of the word: they regulate their body temperature by snuggling with one another (their ugly mugs actually make this image a bit more endearing) and by moving about their labyrinthine (love that word) burrows. 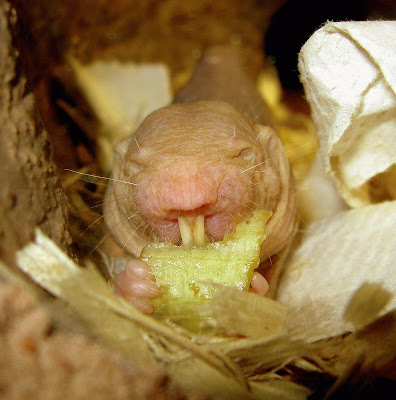 3) Their front teeth are outside their lips, so they don't ingest any dirt while burrowing. 4) They are the only animal whose adult spine will lengthen with the proper blend of (natural) hormones. When a new queen is selected, she actually grows in length to reflect her new status. I think my wife has done the same thing: she seems taller and more regal after every child. Angie was viewing this photo with her seven-year-old son, who asked what it was. 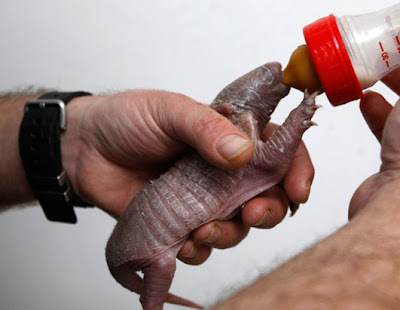 Angie explained that it was a baby armadillo. Her son said it looks more like a worm with a huge mouth. That pretty much sums it up. Maybe a clawed worm, or even an amphisbaenian. 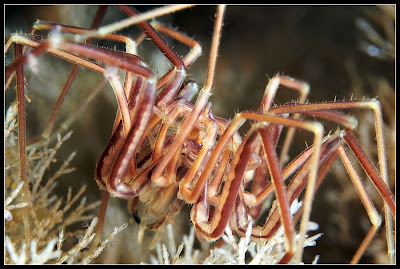 Joe informed me that Wikipedia's picture of the day today features the assassin bug. 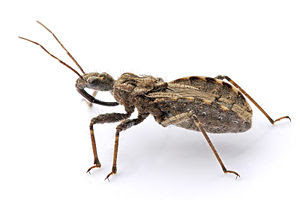 The assassin bug, pictured here (via Wikipedia), isn't terribly assassin-looking. I would have preferred ninja garb, or a trench coat with the collar turned up, or maybe a three-piece suit and a tommy gun, but oh well. I guess a chitin carapace and a blood-sucking siphon for a tongue will do. And I'm sure there are some good nodules and bumps and hooks int here, too. Watch the video below and see where the ugly kicks in. Watch a baby (nymph) assassin bug dine on the blood of a bat (touche,bat). 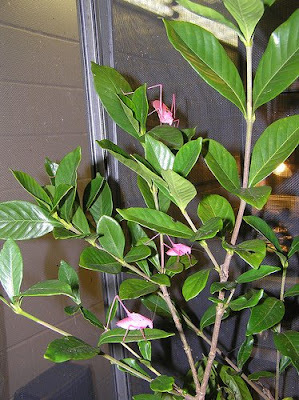 And then check out this link for more photos of assassin bugs in action. I feel compelled to make up for my parasite post yesterday. Consider this a peace offering. 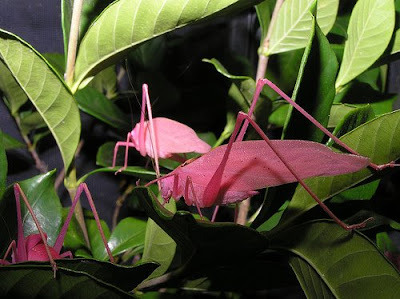 Nothing terribly ugly about katydids (though being an insect is one strike against them), but these ones have caught the attention of the Bleimans over at Zooillogix, and now I bring them to you. Thanks to Vincent for alerting me of their presence. Stop right there. Don't go any further. Some things can't be unseen. You're brain isn't a hard drive from which you can permanently erase images. These images will sear into your neocortex, much to your eyeballs' dismay. Scroll down to find out why. But if you don't want to know why and you want to see previous posts, close your eyes and give your mouse wheel a few rotations, or press that Page Down button a few times. You'll be safe. If you want to read on, you proceed at your own risk. Behold the parasite known as the African Eye Worm. 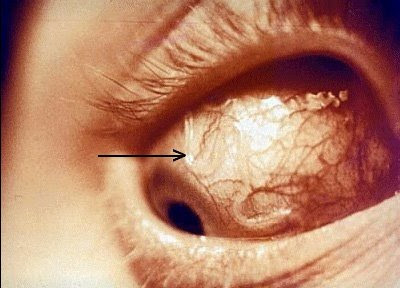 Yes, that's a parasitic worm in that poor soul's eyeball. Read this Wikipedia article (link above) for all the gory details, but suffice it to say that the vectors for this parasite include bites from the horse, deer, and mango flies, and that you don't want this infection. I've been denied the use of photos by offended photographers who say that all of nature is beautiful, not ugly. Well, I guess ugly truly is in the eye of the beholder (pun intended). Thanks again, Becca. My eyes itch now--my one consolation: I've never been to West Africa. 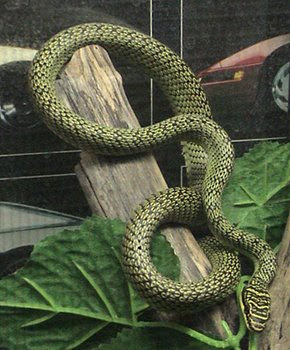 I'm posting on this snake not because it's ugly (in fact, it's one of your more attractive vipers), but because I have no other outlet for when someone presents me with such a remarkable creature (as stolen from Atom). And though you may not find it ugly, you might still find yourself thankful that you don't live in Southeast Asia. 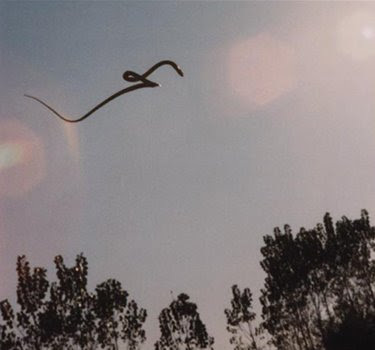 Behold the flying snake. That's right, I said flying. 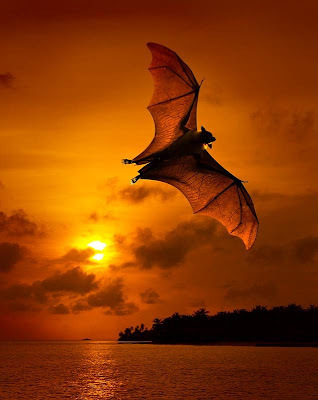 They don't really fly (you need wings or superpowers or warp coils for that), but they do glide. 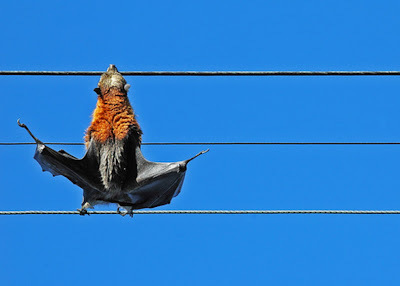 And when it comes to gliding, they put flying squirrels and other gliding mammals to shame (finally, someone can take that uppity flying squirrel down a notch or two). 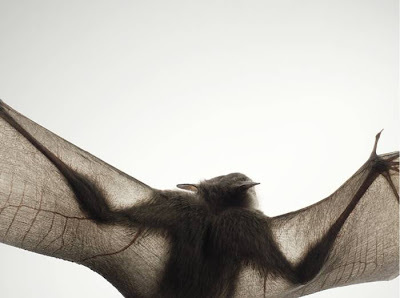 That's because they can glide to distances of over 100 meters. That's a football field, my friends. How do they do it? They launch themselves into the air. That's it. They coil up and launch. Where they land (which is far from graceful) is more a function of ballistics than actual flying technique. But they are able to expand to twice their width, thereby gaining some additional gliding surface. And they do seem to be able to negotiate their path somewhat once airborne. The do so by the time-honored slither. Hey, if it ain't broke, don't fix it. They are excellent climbers, as aided by the keeled scales on their bellies. Why do the fly? Do they need a reason? Really? Would you need a reason? 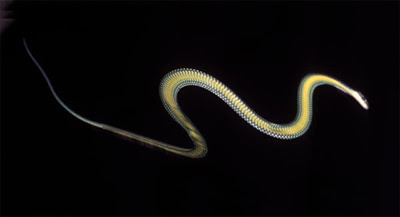 But these snakes usually do have a reason: to escape a predator, to hunt down something (I can't imagine what's going through a mouse's head when he peeks over his shoulder and sees one of these careening towards him), or just for good ol' fashioned getting around. So, the next time you're in Southeast Asia, look up, think vertical. Not all threats come at you from ground level. Not even snakes. Thankfully, they're mild tempered, and mild bevenomed (that's not a real word, is it). That's some solace. 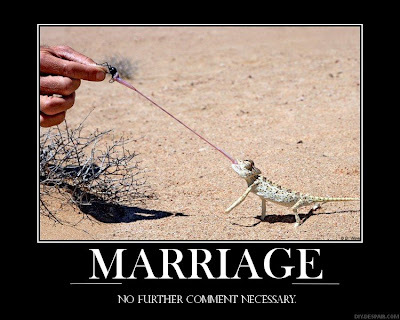 Otherwise you'd have an ill-tempered, lethal, flying snake. I don't know if I could live in that world. Thanks for the article, Becca. 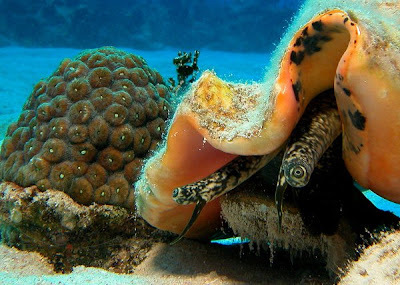 Conchs come in all sorts of shapes and sizes; the term has been vulgarized to refer to any number of marine snails. But true conchs have that familiar claw shape, which they use to dig through the sand and to push it along in short bursts (can't really picture that one). The largest extant conch is the queen conch, which can reach a size of three feet. I don't know if this is a true conch. All I know is that it is looking at me, and I wish it would stop. 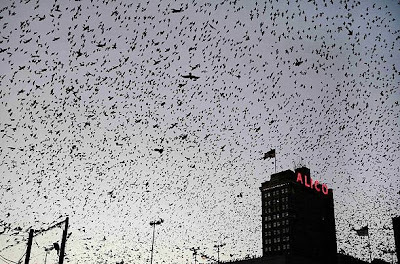 In light of yesterday's bat guano roaches, I thought I'd post a bunch of gratuitous bat photos. Enjoy. I'll be staying indoors the next few nights. Here's a video to watch during a meal. Ever wanted to see a gazillion guano-eating roaches scrambling across a cave floor? Your wish is granted. Thanks Menolly42. You've given me one more reason to steer clear of dark, foreboding places. Amanda made this. Since she's single, she thinks she can get away with it. Anyway, Happy St. Valentine's Day. You may have read about this in the news. The world's largest snake has been discovered in the hinterlands of Columbia. 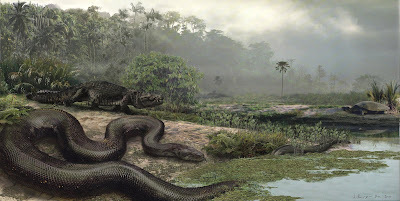 It is a boa, Titanoboa cerrejonensis, that reaches 42 feet in length, and weighs in at well over a ton. The one saving grace in this whole story: the snake has been extinct for eons. The finding calls into question the idea that the climate system has a 'thermostat' that regulates tropical temperatures. But I'll leave that debate to those who are smarter and more educated than me (an easy feat to accomplish). Let's get back to it's size. It's about the length of your typical city bus, and in terms of girth, if it slithered past you, it would brush against your hip. They most likely preyed on crocodiles, deer, and fleshy, out-of-shape bloggers. Thanks for the article, Jennifer and Rebecca. Rebecca pointed out that this picture is well done, but too idyllic -- happy snake in a happy park. When she saw the show about this find, the scientist said that if this snake and a T. Rex faced off, he'd put his money on the snake. We need a scarier image. Anyone care to doctor it up, or conjure a new one? Here's a video from Science Friday (great show!) about humans' responses to various creepy crawlies, including arguments for the thought that maybe our responses are more cultural than biological. It's compelling, and it's gross and creepy and oogy. What else did you come here for? Thanks for the video, Wendy. 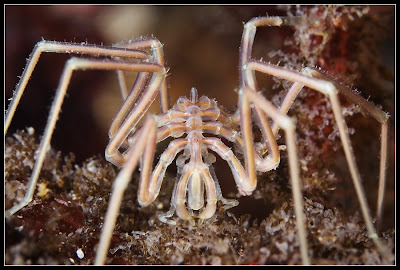 The sea spider is no stranger to this blog. And though I have lamented the presence of anything spider like in the ocean, never before have I been so freaked out by this denizen of the arctic depths. It's all thanks to Alexander Semenov (see more photos here). 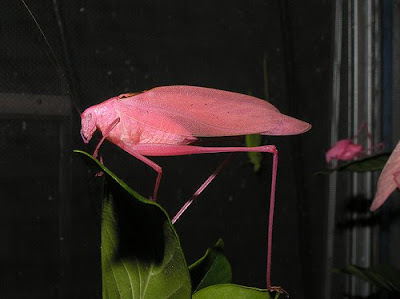 From above, especially with the majority of the legs out of view, the predatory Nymphon grossipes can almost be mistaken for coral. Almost. 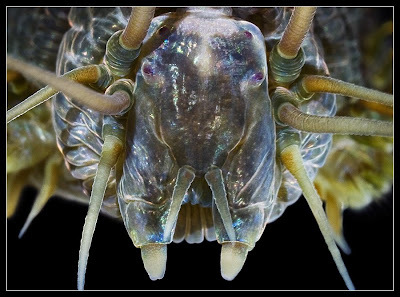 It's not until we get to the side and frontal shots that the sea spider is seen for what it really is: the colorful inspiration for the larvae from Aliens. This next photo is of a pair in the process of mating (yes, have all children and those lacking intestinal fortitude turn away). 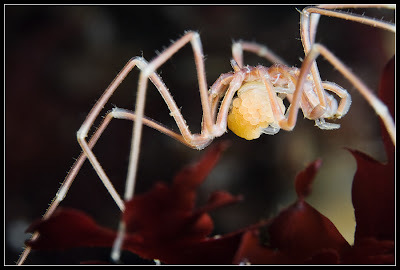 Here's a daddy sea spider, complete with his little clutch of eggs. Don't let his doting parenthood lull you into a false sense of security. He's just waiting on a chance to ram them down your esophagus with his ovapositor. I've been behind in my posts because my wife recently underwent surgery, and I'm helping her convalesce (which is complicated by all the juvenile, barely ambulatory human offspring running around at my feet). 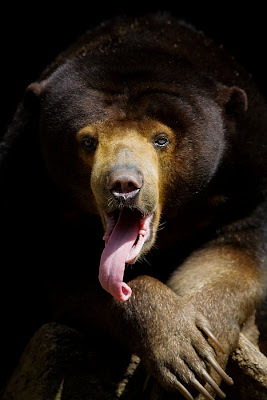 At the end of each day I look like this sun bear. We may not share the same prodigious tongue and claws, but we have exhaustion in common. Fatigue is universal. 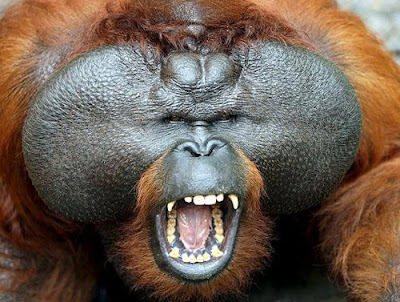 It's been a while since my last orangutan post. The problem is that most photos you find are of fairly placid individuals, or of adorable little ones (twins, or in diapers--too much, with the tufts of hair, and liquid eyes...anyways). But here we have a dominant male in his wrath. That's a mug that commands respect. Once again, I appreciate the flashing of teeth and the pee-my-pants vocalizations that so often precede attacks from mammals. 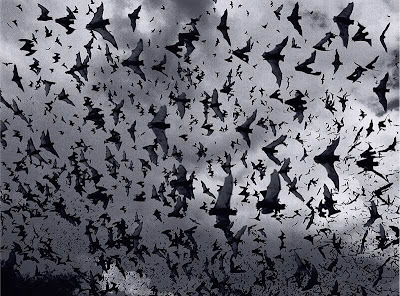 They give me a chance to run away and cower another day. 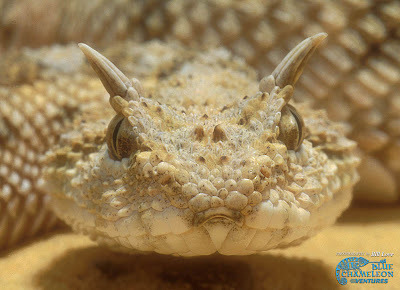 The horned viper is a bitty little (one to two feet) African venomous viper, but he packs a wallop when it comes to the 'if looks could kill category'. Still, they are fairly docile, as far as vipers go. And they give you the courtesy of coiling into a C shape and rubbing their coils together when aggravated. Such visual and audible warnings are Mother Nature's gift to heavy-footed people like me who are prone to close encounters with rattlesnakes, feral cats, etc. 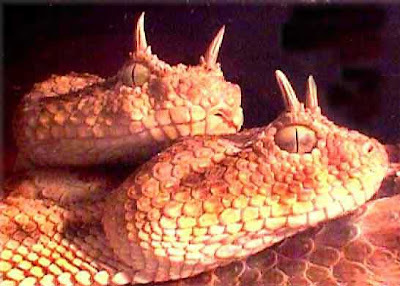 As a sidenote: not all horned vipers are horned. Some, inexplicably, don't sport horns. How disappointing would that be as a horned viper? The one thing your species is known for, and you don't have it. I guess that would make you a plain ol' viper. You'd probably have to compensate elsewhere, just to distinguish yourself. Get belligerant, go vegan, something. But then you wouldn't be known as simply the 'hornless guy', but now as the 'cranky hornless guy' or 'vegan hornless guy'. You just can't win. A recent foray into the hinterlands of Columbia has turned up oodles of new critters. 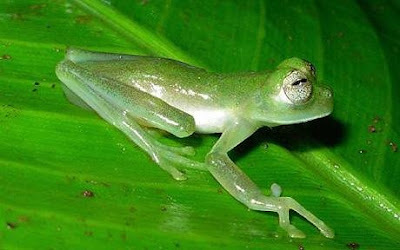 About 60 species of amphibians, 20 reptiles, and almost 120 birds were recorded, many of which are brand new species. And guess what, no where is there any mention of a new spider species. That might be a first. 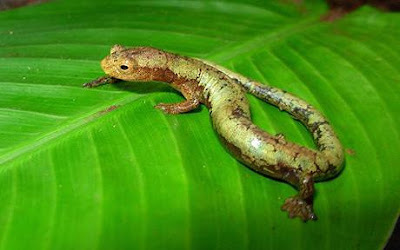 Amphibians are considered to be leading indicators for environmental problems, and the fact that so many were found is a good sign, says Conservation International, who spearheaded the project. Columbia is considered to be one of the most biologically diverse countries in the world for amphibians, with 754 species recorded. It's a veritable Noah's Ark (if a moist, slimy, and slippery one). So, enjoy this salamander (Bolitogloss taylori) and glass frog (Nymphargus sp.). It's nice to bring some good news. Thanks for the article, Betsy. Isn't that a fantastic name for a novel or a children's story? You're looking King Ragworm in the face. 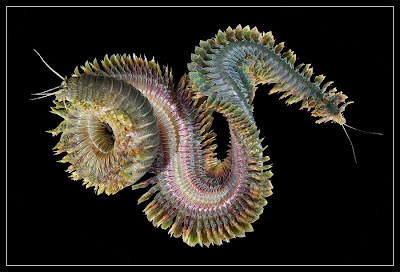 Also known as Nereis virens, or a sandworm, this particular specimen was photographed by Alexander Semenov. 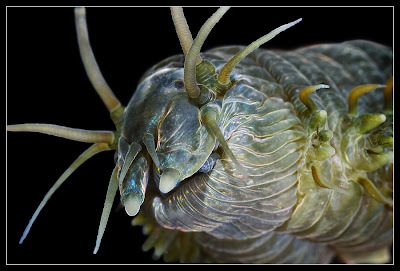 Sandworms can get to be as large as four feet long, and are the prey of fishermen, who use them as bait. 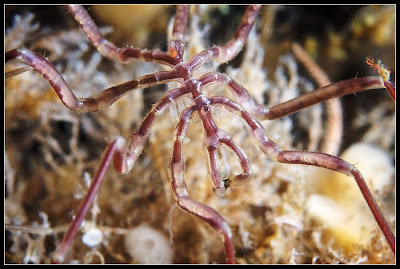 The wikipedia article on the King Ragworm is suspect, but supposedly those feet are better referred to as vascularized parapodia, which aid in locomotion, are the principle organs for respiration, and are involved with sexual arousal. Read the article and you'll see why I suspect the author's professionalism and truthfulness. 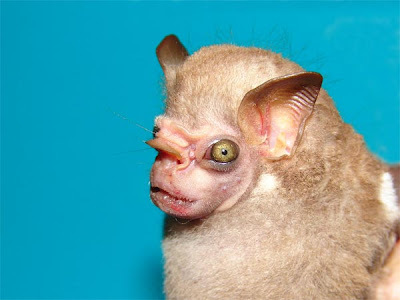 It's hard for a non-biologist like myself to find a site that will describe this creature in layman's terms. Woe is me. Male (lower image, top) and female (lower image, bottom) whalefish look so different that researchers have only now recognized that the two belong in the same family. 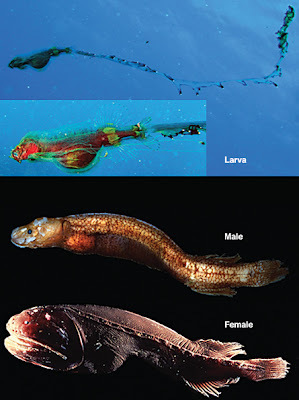 The larval whalefish are even stranger (upper image with inset of body in close-up). I can't blame you for this mistake, fish identifiers of the world. I would assume they were three different fishies as well. I'm sure the whalefish is relieved to have this cleared up. The whalefish is a rare fish. And here is rare footage of one. Most jellyfish are considered plankton -- that great amalgam of free-floating flora and fauna that is the foundation of the oceanic ecosystem. But not so with the box jellyfish. These jellies are hunters. They are active swimmers, are able to negotiate obstacles, and can make a rapid 180-degree turn. How do brainless creatures hunt and avoid obstacles? With 24 eyes that give them a view in literally every direction (not just 360, but up and down as well). It's one particular set of eyes that are so fish-like in their lens composition that they can discern shapes and color. It's that pair of eyes that you see to the left. Imagine swimming up behind one, only to have it spin around and stare you down. And stare you down is right, because you'd be best served by fleeing. 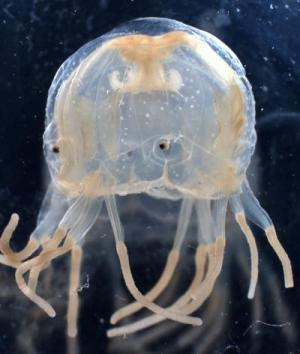 Box jellyfish are counted among the most lethal of animals to humans, as thousands of Australians have been killed over the past 50 years after encountering the jellies' stingers. And if the sting doesn't kill you, you're still left with excruciating pain. Lovely. Most of the jellyfish I encounter come in the form of lifeless gelatinous lumps in the sand. If I ever get to live out my dream of diving in Australia, I'll need to keep these monsters in mind. Thanks for the box jellyfish, Rebecca. Morgan is studying the behavioral neurosciences, which includes learning the incredibly complex ins and outs of bat echolocation and fish electrolocation (that's a fun word to say out loud). 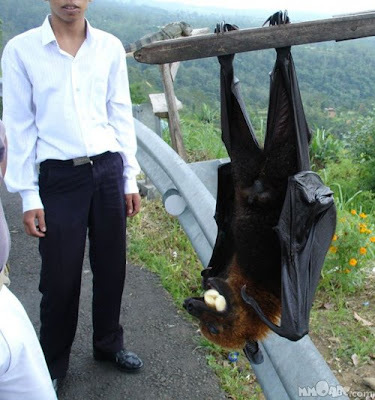 Morgan took time out from the coursework to send us a new bat: Sphaeronycteris toxophyllum, the visored bat. ...wait...um, Google is telling me something different. Evidently, a frugivore is one whose diet consists mainly of fruit. Still, you need to be afraid. Just stare into those bulging eyes and peek beneath that fleshy flap, and you'll know why. In this second photo the female looks like she's smirking, like she knows something I don't. I hate that. Click on this last photo for a larger view. The side view of the skull looks disturbingly human, if more fangy than normal. It looks a lot like the ultrasounds taken of one of my daughters while in utero... that's more than a little freaky. Thanks, Morgan. The Amazon just got a bit less hospitable.